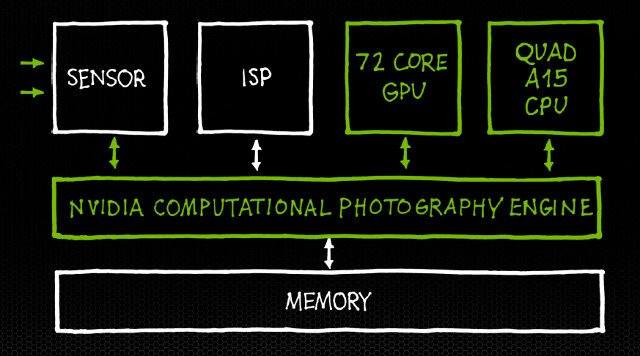 Nvidia GRID Platform – Cloud Gaming Server with 240 Nvidia GPUs. Nvidia Tegra 4 – Nvidia 4 cores Cortex A15 , 72 GPU and SDR modem SoC for tablets and smartphones. Nvidia Project Shield – Game console with a 5″ display powered by Tegra 4 that can also act as a game controller, and play PC games on your TV. NVIDIA GRID Cloud Gaming Platform is comprised of 20 GRID server per rack with a total of 240 Nvidia GPU capable of 200 TFLOPS or the equivalent of 700 Xbox 360. 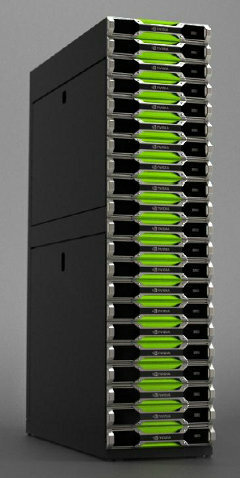 Nvidia GRID render 3D graphics in the cloud in order to allow virtually any device (e.g. smart TVs, PCs, tablets and smartphones) to play PC quality games on their devices. So one day, you may be able to play high-end games such as Battle Field 3 on your Raspberry Pi. Densest GPU system architecture: NVIDIA GRID provides the highest number of concurrent, interactive data streams by using multi-GPU servers and sophisticated NVIDIA VGX GPU-sharing technology. Each server can deliver up to 36 game streams. Broadest compatibility and scalability: NVIDIA GRID software and drivers enable interactive streaming of the widest range of games – from casual games using low-graphics capabilities with a high density of streams, to high-performance titles requiring high-graphics capabilities. Best interactivity: NVIDIA GRID delivers streamed content for seamless interaction without noticeable lag or latency. NVIDIA GRID technology reduces game server latency by up to 30 milliseconds compared to prior solutions, which effectively hides the network delivery time. Game play from an NVIDIA GRID server feels like that from a console next to a TV. There are currently 6 partners with games on the platform: Agawi (United States), Cloud Union (China), Cyber Cloud Technologies (China), G-cluster Global (Japan), Playcast Media Systems (Israel), and Ubitus (Taiwan). During the keynote, they demoed “Trine” on a LG TV where the GRID client had been ported, and the game rendered in the GRID platform. After several leaks (1, 2), Nvidia Tegra 4 processor specifications (4x Cortex A15, 72 GPU, 4G LTE modem) are not really news, and Nvidia CEO did not spent much times on technical details, and focused on demo showing why more processing power is needed in mobile devices. The first demo compared the Nexus 10 (Samsung Exynos 5250 dual core Cortex A15) against a Tegra 4 tablet, where both tablets rendered 25 pages locally. The Nexus 10 took 50 seconds (2 seconds/page), but the Tegra 4 tablet just took 27 seconds (~1 second per page). More processing power will allow much better computational photography. The second demo is about HDR. I’m not very knowledgeable, and that’s an euphemism, when it comes to photography, and today I’ve learned about HDR (high dynamic range), a technique that takes 2 shots (low exposure/high exposure) and combines those to have optimal background and foreground in your picture. This can improve greatly pictures if background and foreground luminosity are much different, as shown in the picture below, where the final picture on the right is the combination the first 2 pictures. HDR is already used in the latest phones such as iPhone 5, but the whole process takes about 2 seconds because a lot of the work is handled by the CPU, and this will work fine with static scene, but not so much with moving objects. Nvidia has a computational photography engine that makes use of the GPU and other components of Tegra 4 SoC to bring this time to 0.2s per frame, even allowing HDR movies. The diagram below shows roughly the data flow, and components involved. They demo photography and real-time HDR at the keynote, the latter is not possible on current devices. Existing Android applications will be able to take advantage of HDR technology without modifications, as this is done by the SoC. Eventually all that processing power will allow features made possible thanks to faster computational photography such as HDR panorama, strobe motion, 3D reconstruction and object tracking, and our powerful camera phones may even possibly surpassing capabilities of DSLR cameras in the future. They concluded Tegra 4 part with a demo of Dead Trigger 2, and a short introduction of Icera i500 soft modem used in Tegra 4 to provide 3G/4G(LTE) connectivity. This SDR modem is 40% smaller than conventional LTE modem. 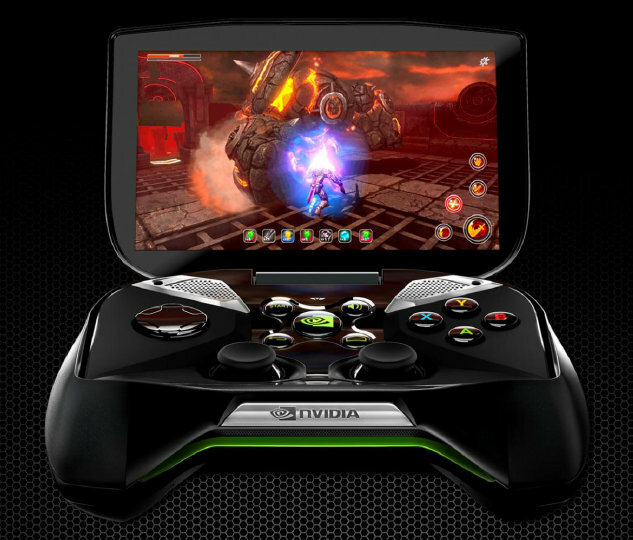 If Nvidia Tegra 4 was greatly anticipated, Project SHIELD game console powered by Tegra 4 was well kept secret until CES 2013. Watch the short video below to see a 3D view of the Nvidia console. Game UI with a selection of games from Android, STEAM, TegraZone… and your PC. Pressing the “SHIELD” button will switch between Android and Game UI. He played some tablet games (sorry can’t remember) both directly on the device, connected to the TV, and showcased multiplayer mode with 2 Project SHIELD consoles. But the most impressive part was when they played PC video games on the TV using the SHIELD. The demo did not go very smoothly, but they were soon able to play high-end games such as Assassin Creed III and NFS most wanted on their 4K LG television. You “just” need a PC with a GeForce GTX 650 GPU or higher connected to your LAN, which will render the game, and stream it to project SHIELD via Wi-Fi or Ethernet, and display it with HDMI on the TV. The demo was done via Ethernet since Wi-Fi is usually slow a conferences, so he must have simply connected a microUSB to Ethernet adapter for the demo. Visit Nvidia Project Shield page for more details. I’ve watched the keynote (nearly 2 hours), and found it pretty informative and entertaining, so if you have time to spare, you can also watch it below.